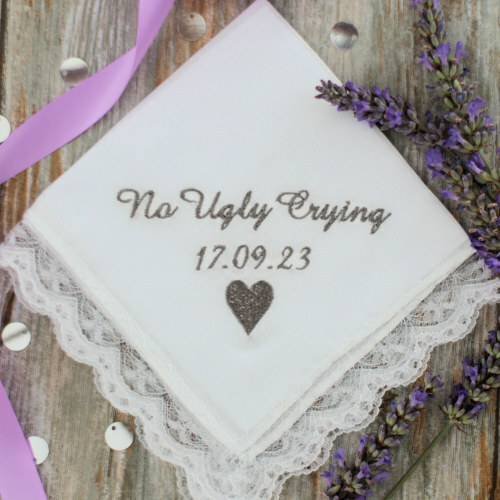 No Ugly Crying bespoke cotton wedding handkerchief with a floral lace trim. This ladies cotton handkerchief features a pretty lace trim around the edges and is custom embroidered with the popular wording No Ugly Crying made famous by Kim Kardashian at a celebrity wedding. You can choose the letter font style and text thread colour you want the wording sewn in. In the text box enter your own special wedding date to be embroidered (if you prefer initials or a name in place of a date please enter this instead). Optional to add a little embroidery motif (such as a heart) and you can select if you want to add gift presentation for your personalised handkerchief.